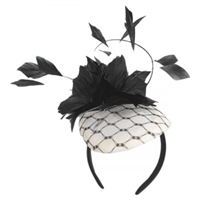 White Black Swirl Pattern Fascinator Hat with Headband, Made of 100% polyester. One size fits most with headband clip. Crown measures 7 1/2 x 7 3/4 inches with bow and mesh decoration. Headband measures 1/2 inches wide. Something Special 100% wool felt rhinestone and bow pillbox hat. Something Special- Organza Fancy Hat w/ Roses. Adjustable inside band. Summer dazzler great for the Kentucky Derby!